About San-Ai Japan„ San-Ai Corporation, U.S.A.
San-Ai USA is proud to be in close partnership with Petrochemical industry leading and Tokyo, Japan based San-Ai Corporation, JPN. 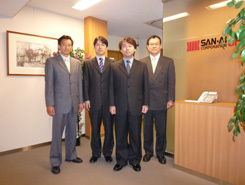 San-Ai JPN has been at the cutting edge of the Petrochemical industry for nearly a quarter century. As a leading supplier to major Japanese manufacturing companies, San-Ai JPN is now positioned to play a pivotal role in the transfer of several unique high technology products to the North American marketplace. Working together on a daily basis, both companies (San-Ai USA and San-Ai JPN) will be able to seamlessly collaborate on transoceanic projects. Whether a fast turn-around single source product need to a vertically integrated new product concept (from design to manufacturing to final delivery and roll-out) San-Ai USA will be able to introduce many items to North America, for immediate customer review. Ken Miura brings nearly 40 years of expertise in the Petrochemical industry to San-Ai Corporation. In fact, it was Ken who devised the concept for San-Ai Corporation, USA many years ago. Now, his dream of a USA/JAPAN collaboration has become a reality. An important point is San-Ai Corporation's emphasis on pursuing environmentally friendly goals in all processes as a commitment to the future. We hope that you, our customers and vendors alike will directly benefit from this commitment of service by San-Ai Corporation spanning the shores of the Pacific Ocean from the United States of America to Japan!